For the last couple of years we’ve been teaching Practical ARM Exploitation. It’s sold out at every public offering (CanSecWest 2012 and BlackHat 2012 & 2013) and we’ve been fortunate enough to give it privately to a number of really amazing organizations. In 2011 we did a talk entitled “Hardware Hacking For Software People” at ReCon about how we’d begun tinkering in the off hours with hardware devices. Two years later (in early 2013) we spoke at NoSuchCon in Paris, France about how the ARM Exploitation and “hardware hacking” was beginning to really converge. For the last few years (while maintaining our full consulting load during work hours) we also started (in the “after hours”) manufacturing fully assembled FaceDancers for the community (at INT3.cc) while developing our own hardware/software product called Tally. This is the course that we’ve always wanted to take ourselves. It is the course that I as a reverse engineer and software security/exploitation person wanted to take before I started tinkering with the stuff that went into our 2011 “Hardware Hacking For Software People” talk. We have always wanted to take a course to give us a solid enough foundation to begin plying our “software security” skills against embedded systems…A course that would help us hurdle the “hardware barrier to entry”. This is that course. We teamed up with Joe Fitzpatrick of SecuringHardware.com to offer what we think will be an awesome course for software reverse engineers, software security specialists, exploit writers, forensics investigators, and developers alike. In this full four-day course we will teach and do hands-on exercises against real-world Commercial-Off-The-Shelf consumer products like routers, mobile devices, game systems, and other embedded systems. 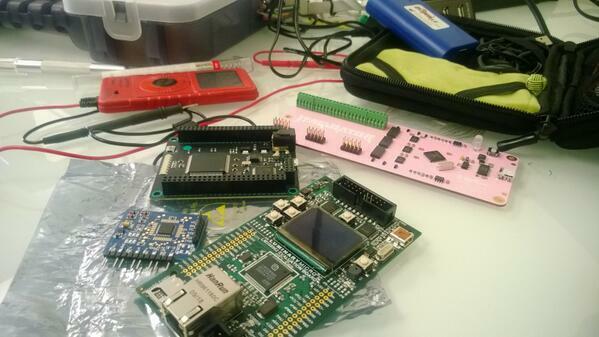 We’ll also target simpler hardware devices that were custom developed for the course. (These “contrived” targets will only be used for a few select units with most of the exercises being against real targets.) The course consists of roughly 20 units each designed to teach specific techniques and concepts. Simple Side Channel Attacks: how they work and how to use them in the real-world. Power Analysis and Power Side Channel attacks. Students will also be introduced to a number of broader techniques, tools, and concepts which are too expensive or time consuming to perform in this course such as differential power analysis, FPGAs, low-power RF technologies…just to name a few. In this course we will also send some students home with hardware devices such as our manufactured FaceDancers, BusPirates, copies of Android Hackers Handbook (which discusses many of these topics), and maybe more. The goal of this course is to get “straight to the point” skipping EE theory and “how to use a soldering iron” fundamentals and getting straight to practical hardware knowledge that can help you immediately begin reverse engineering and attacking embedded devices. To get the most from this course you simply need to have the basic skills of a good software developer. Ideally some exploitation experience recommended but not required. Experience with software debuggers (such as GDB or WinDBG) or strong understanding of what a debugger is. Familiarity with disassemblers (such as IDA) or the concepts of disassemblers. We are really looking forward to sharing this class with the information security community and the broader technology community as a whole. Please let us know what you think… A full syllabus as well as planned venues will be available shortly. ** Simul-post over at Joe Fitzpatrick’s blog as well. what is the name of the Green(ish) board at the bottom of the first picture? the board with a small LCD on it. Where can we take this course? it’s nice posting about embedded training . Do you provide any embedded sys hacking courses Online?? ?